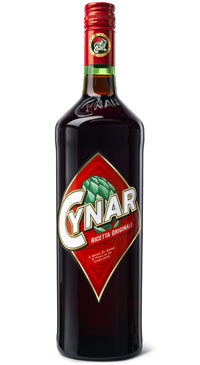 Cynar is an Italian artichoke based bittersweet liqueur known for its versatility and distinctive flavour its taste is enriched by an infusion of 13 herbs and plants. The name of the drink derives from Cynar scolymus, the botanical name for artichoke. Created by Angelo Dalle Molle, a Venetian entrepreneur and philanthropist, Cynar was launched in Italy in 1952. Since then, the brand has grown and is now distributed internationally. Cynar (16.5 % ABV) is an ideal pre or post dinner drink, and a favourite amongst mixologists wanting to create “pungent” and original cocktails. Mix it with soda water and a slice of lemon or orange, mix it with orange juice, or make a variation of a Negroni; gin, vermouth and Cynar (instead of Campari) garnished with a twist of orange for a bittersweet Italian aperitif.